Fall is leaf-peeping season in Colorado. For the best color viewing in the state, get off the beaten path in Glenwood Springs for autumn colors without the crowds. Fall is fleeting in Colorado, you need to catch it while you can. It’s one of the state’s most breathtaking seasons for appreciating the natural beauty of the mountains, but it doesn’t last long. Taking a drive is a good way to catch a glimpse of the fall foliage; but what’s even better is getting out of the car for the full sensory experience in Glenwood Springs: crisp autumn air, saturated blue skies, snow-capped peaks and mountainsides ablaze in golden hues. This fall leave the roadside gawkers behind. Instead, find your perfect trail for hiking and biking, fish a secluded stretch of river or soak in the geothermal hot spring pools. Each option combines favorite Glenwood Springs activities with stunning fall panoramas—all minus the mobs. Glenwood Springs keeps expanding its biking trails and terrain. The newest options for mountain biking include the Grandstaff Trail on Red Mountain and the trails in South Canyon. Boy Scout, Wulfsohn, Jeanne Golay, Transfer Trail and Dry Park Road are all solid choices for rides with breathtaking backcountry scenery. Road cyclists also have miles of choices including the paved surfaces of the Rio Grande Trail and the Glenwood Canyon Recreation Path. One follows the Roaring Fork River from Glenwood to Aspen and the other meanders along the Colorado River. Both offer knockout views. If hiking is your thing, fall, with its vibrant color palette, is an ideal time to hit the trails. 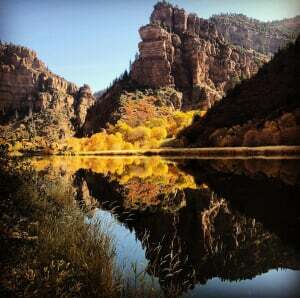 Try Babbish Gulch at Sunlight Mountain Resort or trails in Glenwood Canyon—No Name, Grizzly Creek and Hanging Lake—as well as educational hikes like Storm King Memorial Trail and the Mitchell Creek Trail which starts near the Glenwood Springs Fish Hatchery. Easily accessible from many Glenwood Springs hotels, visitors can also choose a leisurely river walk along the Rio Grande Trail or drive to one of four rest areas in Glenwood Canyon to wander along the Glenwood Canyon Recreation Path. From steep to strolling, come fall Glenwood’s hiking trails are radiating autumn ambiance. Find the one that’s a perfect match for your level of enthusiasm and energy. Some towns are more fortunate than others and when it comes to nature’s bounty, Glenwood Springs is a lucky locale indeed! Not one, but two rivers converge in Glenwood Springs, each offering an abundance of shore and float trip fishing opportunities. For the best catch of the day, cast away on the region’s designated Gold Medal Waters—there are 22 miles of Gold Medal Waters along the Roaring Fork River from Basalt, south of Glenwood Springs, all the way to its confluence with the Colorado River. One of the most relaxing methods of absorbing the beauty of Colorado’s fall foliage is to simply just take it all in from a comfortable perch in a geothermal hot springs pool. 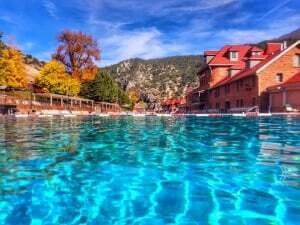 Glenwood Hot Springs Resort is home to the world’s largest hot springs pool and Iron Mountain Hot Springs features 16 mineral soaking pools. Both properties are surrounded by mountains, that come fall, create a dazzling seasonal landscape. Fall is fast approaching, make plans to see the colors without the crowds in Glenwood Springs! Connect with VisitGlenwood and never miss a special again: Join Today!